For over 10 years, Neighbourhood Network has teamed with non-profits in the community to make the holiday season a little brighter by collecting gifts, food and other items for families in need – and, one decade on, the need only grows. 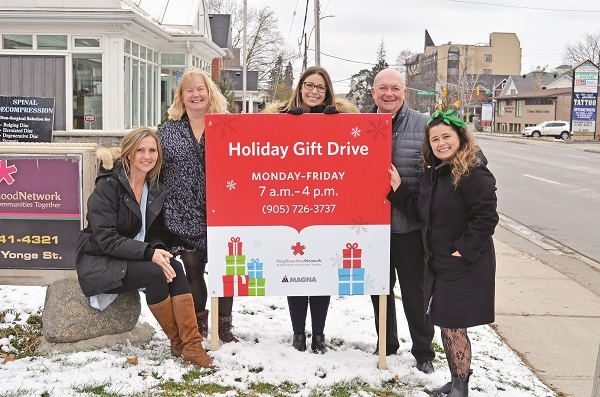 Neighbourhood Network launched its 2018 Holiday Gift Drive this past Monday, an initiative that will last through the home stretch, right up until December 21. 400 non-profits throughout northern York Region have partnered with the volunteer organization this year, highlighting the diverse needs – yet, in many cases, very basic needs – that impact all corners of York Region. This is particularly heartening as Neighbourhood Network encourages businesses, groups, teams and even individuals to take on “adopting” a family or person in need for the holiday season. Last year, Neighbourhood Network’s Holiday Gift Drive helped adopt 108 families in York Region and, in the process, collected an estimated $66,000 worth of donations to the cause. Some donated those two cans of soup, some donated toys, others donated some new clothes, but oftentimes these donations came in the form of gift cards, a particularly hot commodity when it comes to this particular gift drive. “Sometimes we have had people coming in and saying, ‘My kids have grown up and they don’t need anything, so we decided to adopt a family because we have everything and more,’ but when you see the wish lists from some of these people, at the top are diapers and wipes because they ran out of funds and are unable to buy it themselves,” says Ms. Pelyvas. “It just really clicks with people when all they have requested are rolls of toilet paper or a can of tuna. Additional needs include items perfect for teens and adolescents – requests often include gift cards for Chapters, Cineplex and restaurants, or items like earbuds – and Christmas trees, whether they are fresh cut or gently used artificial trees that still have all the necessary pieces. For more information on the Neighbourhood Network Holiday Gift Drive, visit neighbourhoodnetwork.org/?t=programs&id=2 or call 905-726-3737.